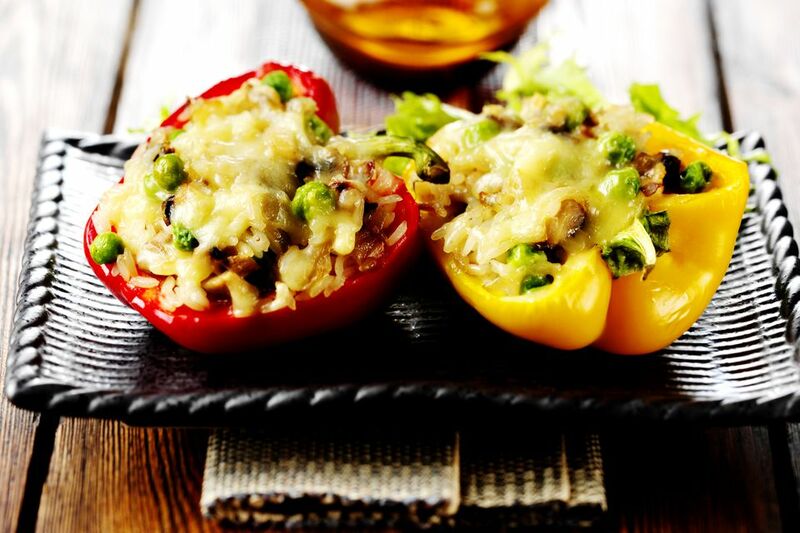 These stuffed peppers are the perfect dinner solution for vegetarians, or for anyone who likes to have a meat-free meal now and then. The stuffed peppers make a tasty side dish as well. Serve them along with steaks, chicken, or fish. Or make them a luncheon dish with a cup of soup or salad. The recipe calls for red bell peppers, but a combination of colors can make for an attractive presentation. A simple mixture of rice and cheese makes up the filling for the peppers, which makes them a blank canvas for many other possibilities. Add 1/2 cup of more of steamed peas, chopped broccoli, or chopped sauteed kale or spinach to the rice. Replace the 3/4 cup of water with vegetable broth or chicken stock for additional flavor. And if you crave heartier main dish stuffed peppers, feel free to add about 1/2 cup of cooked beans. Or add 1/4 cup of cooked crumbled bacon or 1/2 cup of diced chicken, turkey, ham, or tuna. Cut the bell peppers in half lengthwise; remove the stem, seeds, and ribs. Place the peppers in a large saucepan of salted water and bring to a boil; cook for about 5 to 10 minutes, or until just tender. Drain and reserve the cooking liquid. In a medium saucepan, combine the rice with 1 1/2 cups of the water and 1/2 teaspoon of kosher salt. Place the saucepan over medium-high heat and bring to a boil. Reduce the heat to low, cover the pan, and simmer for about 15 to 19 minutes, or until the rice is tender. Remove the rice from the heat and let it stand without removing the cover. Fluff with a fork just before serving. Meanwhile, heat the butter in a skillet over medium-low heat. Add the onion and cook until softened and translucent. Add the remaining 3/4 cup of water and the cheddar cheese; stir until smooth and well blended. Remove from the heat and add the rice; season to taste with salt and pepper. Add the chopped parsley and stir to blend. Pour about 1 1/2 cups of the liquid from cooking the peppers into a deep skillet or saute pan. Place a rack in the pan and bring to a simmer. Fill the pepper halves with the rice mixture. Arrange the filled peppers on the rack. Cover the pan and simmer the peppers for about 15 minutes. Louisiana Stuffed Peppers: Saute a mixture of 1/3 cup each of diced carrots, onions, and celery along with some Cajun or Creole seasoning. Tex-Mex Stuffed Peppers: Add about 1/3 cup each of black beans, diced fresh tomato, and corn kernels, along with a splash of lime and some cilantro instead of parsley. Season with a bit of chili powder and cumin, to taste.